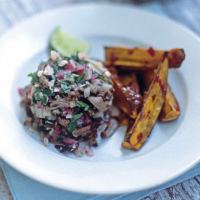 This is a great dish to serve as a starter or light supper; the orange complements the richness of the duck meat. The recipe works well with domestic duck legs too – just poach the flesh for less time. Put the duck in a large cooking pot with the herbs, vegetables and peppercorns and cover with cold water. Bring to the boil, then simmer gently for 15–20 minutes. Allow the duck to cool a little in the poaching liquid, then remove. The flesh should come away from the bone easily and still be a little pink. With two forks, shred the meat off the carcass and set aside. Discard what should have become very fatty stock. Heat 1 tbsp of the oil in a pan and sauté the duck meat for 5 minutes on a high heat. Add the fennel and cook for 3–4 minutes. Add the onion and garlic and cook for a further 3–4 minutes. The vegetables should still retain their crunch but be turning a golden colour at the edges. Allow to cool, then stir in the oregano, citrus juices and coriander. Serve cold or at room temperature with sweet potato wedges that have been roasted in olive oil with chopped red chillies and crushed garlic cloves. Fine Burgundy or northern Rhône reds are great wines to serve with duck. However, with all the other contrasting flavours, a much more interesting choice would be a top-drawer German Riesling with some sweetness.